Forms 15G or 15H can save you from TDS on your interest income earned if your income is below the exemption limit. According to the TDS rules S/194A, if interest income exceeds Rs 10,000 in a year, 10% tax will be deducted at source. If the investor has not furnished his PAN details, the TDS rate will be higher at 20%. However, if the investor's total taxable income is below the basic exemption limit, he can submit a declaration to avoid TDS. 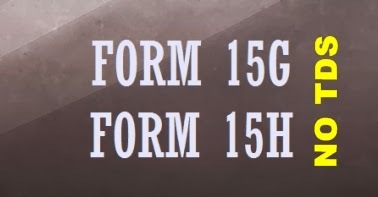 Form 15G is to be used by individuals below 60 years, HUFs and trusts.